Celebrate Great Ideas. Truth Exists. Find it. Curved Brim. Mesh Back. Just Facts. The Factists are just regular people wearing hats that say FACTS or SCIENCE. They are committed to the idea that truth exists and that lies are bad. 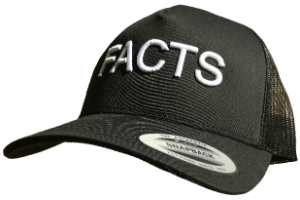 THE FACTS HAT also exists to inspire people to stop worshipping brands and instead celebrate great ideas. If you buy a hat or see someone wearing the hat, snap a photo or video and tag it @Facts_Hat. The Committee to Protect Journalists (CPJ.org) is an independent, nonprofit organization that promotes press freedom worldwide. We defend the right of journalists to report the news without fear of reprisal. Thanks for visiting. And please reach out if you have an idea or you want to partner with us. Also, if you want to purchase more than 10 hats at a time, we can talk about a discount. Send us an email!